The rising consumption of gasoline and lubricant additives and rubber products in the automotive and aviation industries, the expansion of existing production facilities, especially in Asia Pacific, and an increase in the bio-based production of 2-methylpropene have been known to significantly drive the 2-methylpropene market across the globe. The global 2-methylpropene market is poised to register a steady CAGR of 7.07% from 2016 to 2024 in terms of revenue. In view of this, the opportunity presented by this market is likely to rise from US$26.99 bn in 2015 to reach US$49.91 bn by 2024. In terms of volume, the 2-methylpropene market is expected to expand at a CAGR of 6.21% during the forecast period. Globally, the prices of 2-methylpropene are increasing year-on-year due to its wide range of applications. The demand for bio-based 2-methylpropene for the production of jet fuel in the aviation sector is expected to propel the demand for as well as prices of 2-methylpropene during the forecast period. In terms of product, the 2-methylpropene market has been classified into butyl rubber, polyisobutylene, MMA monomer, isooctane, MTBE, and others. By value, isooctane held the leading share of 36.67% in 2015, closely followed by MTBE. Isooctane is used as an octane booster for gasoline and as a primary component in aviation gasoline due to its prominent antiknock characteristic. Majority of isooctane is produced in refineries by distilling petroleum. However, isooctane is also produced from 2-methylpropene. The demand for MTBE is declining and is fast being replaced by isooctane as a gasoline additive. By way of application, the 2-methylpropene market has been segmented into rubber manufacturing, pharmaceuticals, fuel and lubricants, adhesives and sealants, antioxidants, agrochemicals, and others. In terms of value, fuel and lubricants accounted for the dominant share of 63.86% in 2015. Steady growth in the global automotive industry has boosted the consumption of gasoline and lubricant additives as well as rubber products. An increase in the demand for 2-methylpropene in the aviation and automobile industries is therefore expected to propel the global 2-methylpropene market during the forecast period. From a geographical standpoint, the 2-methylpropene market has been segmented into North America, Western Europe, Eastern Europe, Asia Pacific (excluding Japan), Japan, the Middle East and Africa, and Latin America. In terms of value, North America constituted the dominant share of 34.16% in 2015, closely followed by Asia Pacific (excluding Japan) with a 32.16% share that year. While North America leads in terms of installed production capacity, it is expected to lose market share in terms of demand owing to the bans imposed on the usage of MTBE. Geographically, the high demand for MTBE in Asia Pacific (excluding Japan) has resulted in the expansion of existing 2-methylpropene production facilities in China. The demand for 2-methylpropene in APAC is rising at a rate higher than any other region. Even though the demand for MTBE is declining in developed countries such as the U.S., Germany, and Russia, a significant volume of 2-methylpropene-based isooctane is being utilized as gasoline additives in the automotive sector in these countries. Prominent players in the global 2-methylpropene market include BASF SE, Evonik Industries AG, LyondellBasel Industries NV, TPC Group, Chevron Phillips Chemical Company, Songwon Industrial Co., Ltd., Sumitomo Chemical Co., Ltd., Zibo Qixiang Petrochemical Group Ltd., Heilongjiang Anruijia Petrochemical Co., Ltd., and Shandong Yuhuang Chemical (Group) Co., Ltd. This research study analyzes the market for 2-methylpropene in terms of revenue (US$ Bn) and volume (Kilo Tons). The 2-methylpropene market has been segmented on the basis of product, application, and geography. Geographical segmentation includes regions, which are further divided into 19 countries. The report features a detailed regional segmentation with market growth forecasts from 2016 to 2024. 2015 has been considered the base year and 2016 the estimated year, while all forecasts have been given for the period from 2016 to 2024. Market data for all the segments has been provided at the regional and country-specific levels from 2016 to 2024. The report provides a broad competitive analysis of companies engaged in the production of 2-methylpropene. 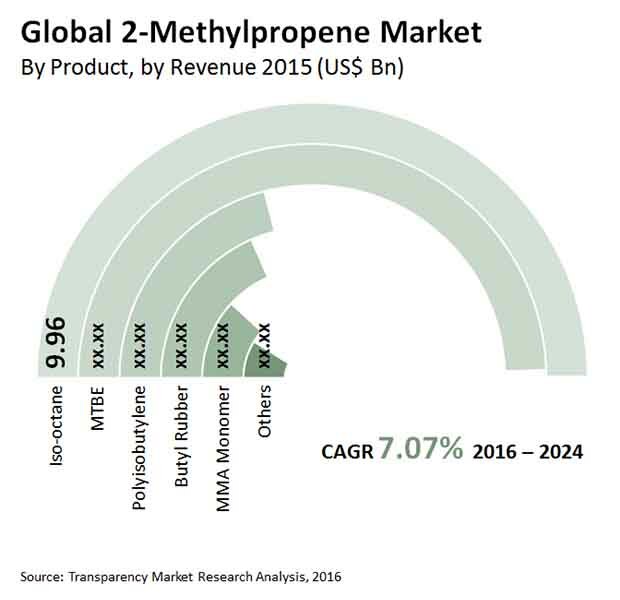 The report also includes key market dynamics such as drivers, restraints, and opportunities affecting the global 2-methylpropene market. These are analyzed in detail and illustrated in the report with supporting graphs and tables. The report also provides a comprehensive analysis of the market with the help of the Porter’s Five Forces Analysis model, which helps in understanding the factors that affect the structure and profitability of the global 2-methylpropene market. These are the bargaining power of buyers, bargaining power of suppliers, threat of new entrants, threat of substitutes, and degree of competition. The report provides detailed insights into the global 2-methylpropene business. Currently, numerous factors drive the 2-methylpropene market. The most prominent drivers include growth of renewable energy, scarcity of energy, and implementation of stringent government regulations to minimize carbon emissions. Market attractiveness analysis was carried out for the 2-Methylpropene market on the basis of product, application, and region. Market attractiveness was estimated on the basis of common parameters that directly impact the market. Products derived from 2-methylpropene include butyl rubber, polyisobutylene, MMA monomer, isooctane, and MTBE. Butyl rubber is synthetic rubber produced by co-polymerization of 2-methylpropene with a small amount of isoprene. Polyisobutylene is a polymer with high molecular weight, it is produced by 2-methylpropene polymerization. MMA monomer is widely employed in several applications, ranging from dental prosthetics and bone cements to contact lenses. Isooctane is used as an octane booster for gasoline and as primary component of aviation gasoline, (also known as avgas), due to its high antiknock quality. The feedstock considered for isooctane production is composed of 2-methylpropene and isopentane, which are produced in refineries through steam cracking of light gas oil. MTBE is produced by utilizing feedstock such as 2-Methylpropene and methanol in the ratio of 1.2:1 respectively. Demand for MTBE is stagnant due to implementation of stringent government regulations, groundwater contamination, health hazards, and environmental pollution. Other products manufactured from 2-methylpropene comprise ethyl tert-butyl ether (ETBE) and plastics. Consumption of gasoline & lubricant additives and rubber products has been increasing due to growth in the global automotive industry. Rise in demand for 2-methylpropene in aviation and automobile industries across the globe is anticipated to drive the 2-methylpropene market during the forecast period. Expansion of existing production facilities coupled with bio-based production of 2-methylpropene has been driving the demand for 2-methylpropene-based products and applications across the globe. The global 2-methylpropene market has been segmented into three categories: product, application, and region. In terms of product, the 2-methylpropene market has been classified into the butyl rubber, polyisobutylene, MMA monomer, Isooctane, MTBE, and others. In terms of application, the 2-methylpropene market has been classified into rubber manufacturing, pharmaceuticals, fuel & lubricants, adhesives & sealants, antioxidants, agrochemicals, and others. In terms of region, the 2-methylpropene market has been segmented into North America, Western Europe, Eastern Europe, Asia Pacific (excluding Japan), Japan, Middle East & Africa, and Latin America. North America dominates the market in terms of installed production capacities of 2-methylpropene, however, in terms of demand, the share of North America is declining due to the bans imposed on the usage of MTBE in the region. High demand for MTBE in Asia Pacific (excluding Japan) has resulted in expansion of existing 2-methylpropene production facilities in China. Demand for 2-methylpropene in Asia Pacific is rising at a higher rate than that in other regions.